From its creation in Northern Greece or Asia Minor to a streambed beneath Rome's Palatine hill to the Capitoline Museums there to the Villa of the J. Paul Getty Museum in Malibu, Ca., with a couple of stops in between, Lion Attacking a Horse, a marble sculpture that dates to the late 4th century B.C., has had quite a journey. Especially considering that it weighs more than 3.3 tons. This monumental piece, which Rome has sent to the Getty under a mayoral project to lend masterpieces to American museums, has an illustrious past, starting with a possible link to Alexander the Great. Cuttings on the lion's back suggest that they may have borne a hunter with a spear, and art historians at the Capitoline Museums believe the piece was part of a larger group inspired by Alexander's storied lion-hunting adventures in Sidon, now in Lebanon, or at a game preserve in Basista, now in Uzbekistan, and erected to glorify his conquests. Some time later – exact date unknown – the piece was brought to Rome, probably as imperial war booty: It was discovered near the Circus Maximus stadium in a streambed where victorious generals displayed their plunder. In 1300, the piece is mentioned in archival documents and located in the Piazza del Campidoglio on the Capitoline Hill – the first piece of ancient art in what became Europe's oldest public art museum. By 1347, it had moved to the steps of the Palazzo Senatorio in the piazza, where it dominated an area used for the administration of justice and capital executions. 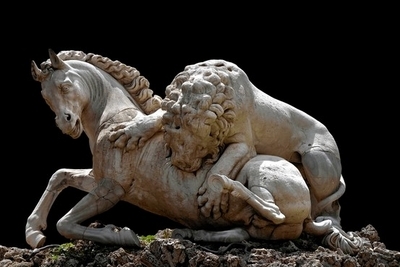 As a result, this dramatic depiction of a fallen horse being devoured by a ferocious lion came to symbolize the city of Rome. By 1474, however, Pope Sixtus IV had moved several other ancient sculptures to the Piazza del Campidoglio as reminders of "ancient excellence and virtue," including the famous statue of a she-wolf suckling the twins Romulus and Remus, which took over as the emblem of Rome. Over the years, Lion Attacking the Horse – nearly 5 ft. tall and more than 8 ft. long – suffered wear and tear, and in 1594, a student of Michelangelo's named Ruggero Bascape restored it, adding the horse's head and legs and the lion's hind legs. It has also inspired other artists. "Probably the earliest reinterpretation is found in bronze group now in the Detroit Institute of Arts, which is signed by Antonio Susini," dated circa 1580-1590, says Patricia Wengraf, a prominent Old Master sculpture dealer in London. "However, many replicas of this ancient marble were reproduced in bronze on a much smaller scale, particularly for the Grand Tourists who visited Italy from the late 17th century." At the Getty Villa, where Lion Attacking a Horse will be on view from Aug. 10 through Feb. 4, 2013, it will be surrounded by works it inspired, including a later Susini, a 1585 engraving by Giovanni Battista de' Cavalieri, and a late 17th/early 18th century Gobelins tapestry.